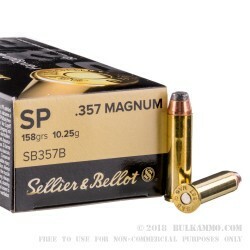 If you're looking for a lever-action hunting load or can't use hollow points in your carry revolver, try this soft point ammo from Sellier & Bellot. 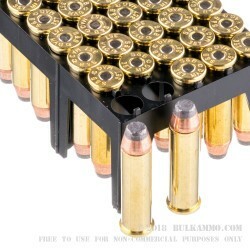 These .357 Magnum cartridges fire a heavy 158 grain soft point bullet at a muzzle velocity of 1,263 feet per second. However, this ammo really shines in longer-barreled guns which can produce the muzzle velocity needed to produce consistent expansion in soft-point rounds. 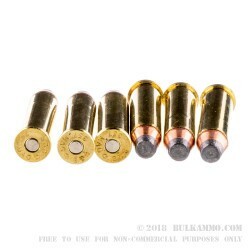 These rounds use a flat-nosed projectile suited to tubular magazines; it provides a semi-wadcutter profile ideal for shooting paper targets as well. Sellier & Bellot ammunition has been loaded for nearly two centuries in the Czech Republic. Today, it is one of the top ammo brands in the world and uses high quality components including non-corrosive boxer primers and reloadable brass cases. Bought a few boxes of this and it was delivered within a week. Great service from Bulkammo.com. 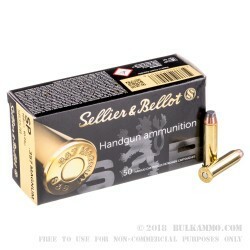 The S&B ammo is very good, low smoke, accurate, high quality and very reliable (no duds). Not the cheapest ammo but one of the best.